As a Clearwater, Florida native, Jarrod Davis found his passion for food while watching his grandmother and mother cook for his family. He quickly realized that food was his passion, and it was time to bring that passion to light. He enrolled at Johnson and Wales University in Denver, Colorado and embarked on a journey of pursuing southern flavors. Upon graduation, Chef Jarrod and his family moved back to Florida to continue building his culinary career. Throughout his time in Florida he worked under many talented chefs in the Tampa Bay area such as Michael Mina, Chris Ponte, and Chad Johnson. In the fall of 2016, Chef Jarrod was ready for a change and moved his family to Iowa to join the Greek House Chefs team. Jarrod started as a chef at a fraternity on the Iowa State Campus and excelled in the kitchen, bringing southern cooking to his Chapter. The Greek House Chefs management team quickly realized that Jarrod’s talents exceed far past cooking and noticed his talent for building up his team in the kitchen and being efficient while maintaining a high standard of service. 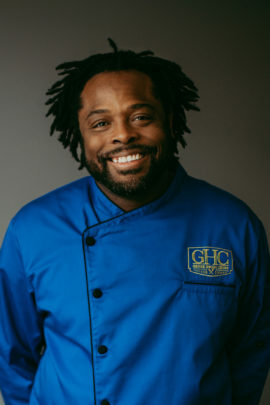 In his time with GHC, Jarrod has helped put his stamp on the Greek House Chefs training program and further developed our signature Creation Stations. As Culinary Director, Jarrod travels across the country training our Greek House Chefs to execute delicious food, top-notch service, and present an immaculate kitchen in Greek chapters across the country.